Today I began meditating with Mutium at The Path. Mutiam was a student of Sri Kaleshwar at his ashram in Penukonda, India. Mutiam’s display of visual materials was distinctly Hindu, but she also included an image of Jesus in the display. 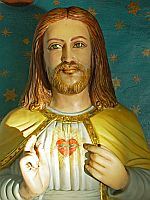 She said that this image was a photograph of the Jesus statue located in the upper temple at Sri Kaleshwar’s ashram. It is a good thing that I had recently read Jesus and the Essenes by Dolores Cannon. From this and similar books, I was aware that Jesus had been educated in India, among many other places. I was glad that Jesus was part of the tradition that Mutiam would be teaching because Jesus has been an important part of my religious history. I resonate well with Him, and I found that this photograph resonated particularly well with me. I found it particularly interesting that this statue featured reddish hair. This agreed with descriptions of Jesus found in sources I had recently read. Stage 1: Light a candle, three to four feet apart. Sit in front of it. The flame should be at the level of the eyes so that it can be seen straight without being uncomfortable. Begin with slow and deep breathing. While breathing in this manner, keep a steady gaze at the flame. Keep the spine erect. 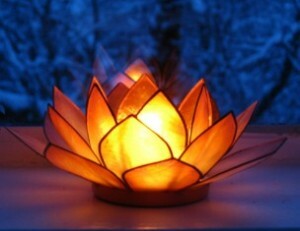 Keep your gaze fixed at the flame without being distracted with the outer disturbances or thoughts. If thoughts arise, simply ignore them; do not struggle to remove them. It is important to be wakeful and vigilant. Stage 2: Imagine the flame is entering your body through your eyes and illuminating your inner being. At this stage, it is good to let the eyes close with ease. Now, try to imagine the same flame with closed eyes as you were seeing it with open eyes. If you are able to practice tratak without blinking your eye, it will be easy for you to see the flame with closed eyes. Most of us are doing our meditations seated in chairs. Others chose to sit on cushions on the floor. Since my legs tend to go numb when I sit on the floor, I chose to sit on a chair. We used a recording of a tamboura for background music.